SEATTLE – Mike Hopkins watched the NCAA Tournament tinged with the slightest bit of jealousy. He saw coaches he had come to know – Chris Collins at Northwestern specifically – who had left behind stable careers as an assistant coach and took the leap to being a head coach. It drove home the idea that Hopkins wanted the chance to create something himself, rather than trying to sustain what had previously been built. 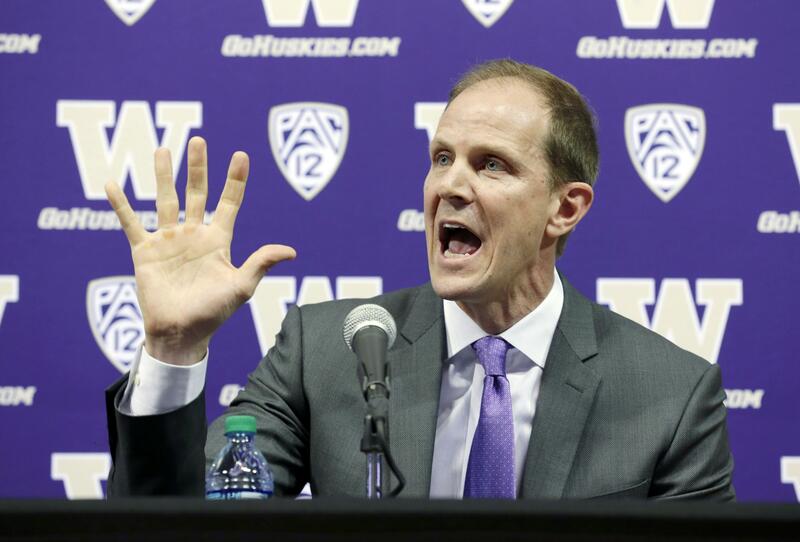 So when Washington came calling late last week with the opportunity at reconstructing the Huskies’ program, Hopkins’ interest peaked like no opportunity presented to him before. The newest Washington coach was introduced on Wednesday with the type of flair typically reserved for head coaches with a lengthy list of credentials, not someone who has nine career games as an interim head coach. But that speaks to the regard Hopkins is held in through the coaching community during his two decades as an assistant at Syracuse and how much of a coup Washington believes it has pulled off by convincing him to leave behind all he’s known at Syracuse for the opportunity in Seattle. Hopkins was deemed the coach-in-waiting for the Orange, set to take over from Jim Boeheim at the end of the 2017-18 season. It was a promotion in writing and seemingly accepted on all fronts. With it, Hopkins would be tasked with maintaining the standard set for decades by Boeheim. By making the move to Washington, Hopkins gets to be a creator, taking a program that has gone six straight seasons without making the NCAA Tournament, but is less than a decade removed from multiple trips to the Sweet 16. Hopkins’ task is trying to rediscover that potential. “It’s very important for me and for everybody here to understand that I wanted to go someplace I felt like I could be at forever and I could build something that everybody had a lot, a lot of pride for. That’s why I came here,” he said. Hopkins’ contract is for six years and pays $1.8 million in his first year and escalates by $100,000 each year through the 2022-23 season, topping out at $2.3 million. Cohen moved swiftly in plucking Hopkins out of Syracuse. Former coach Lorenzo Romar was fired on March 15; Hopkins signed a memorandum of understanding on Friday; and he was announced as the new coach early on Sunday. Cohen began analyzing the program shortly after taking over at the permanent athletic director in May 2016 and was ready to make a change quickly if that was deemed to be the decision. Hopkins is still finalizing his coaching staff but has retained former Washington assistant Will Conroy to his staff. The priority now is trying to keep as much of next year’s roster and recruiting class intact as possible. In a rare confluence of timing, Hopkins’ introduction happened at the same time as star Washington recruit Michael Porter Jr., was being presented with the Gatorade National Player of the Year award and told reporters he had yet to speak with the new Huskies coach. Porter told reporters he would be asking to be released from his national letter of intent, but Hopkins said he planned to meet with Porter soon. Guard Blake Harris, another member of next year’s recruiting class, tweeted on Tuesday that he had been released from his commitment and was reopening his recruitment. Published: March 22, 2017, 5 p.m.